A miracle of medicine? The 6’9”, 235 big man is running the floor. So what you say? After he graduated from the Highland high school in 2011 and the best he could do was walk the floor. His knees hurt and he decided to sit out of basketball for a year to heal the sore knees. Didn’t work so he had two years of surgery’s to repair his knees and last year he ready to play college basketball. Three years away from competitive basketball. Last summer the AVC coaching staff held their breath most of the summer and fall as big Aaron worked out hard with the Marauders. You could tell that Jones was building his lower body strength. As the season started, Aaron slowly built his playing minutes and his skill levels. His knees and body got stronger as the season progress. An excellent student, the big man could move on to university of his choice but he loves the game. I talked to him this week and he said that he is looking forward to his final year on the AVC team. Last week in practice he proved that college ball is definitely a contact sport. He was battling for position in the paint when a very large elbow pushed his bottom teeth through his bottom lip. An emergency room visit and some stitches later he is back on the mend. This could be Mr. Jones year. His knees are looking great and his skill sets are improving. Keep an eye on this big man. 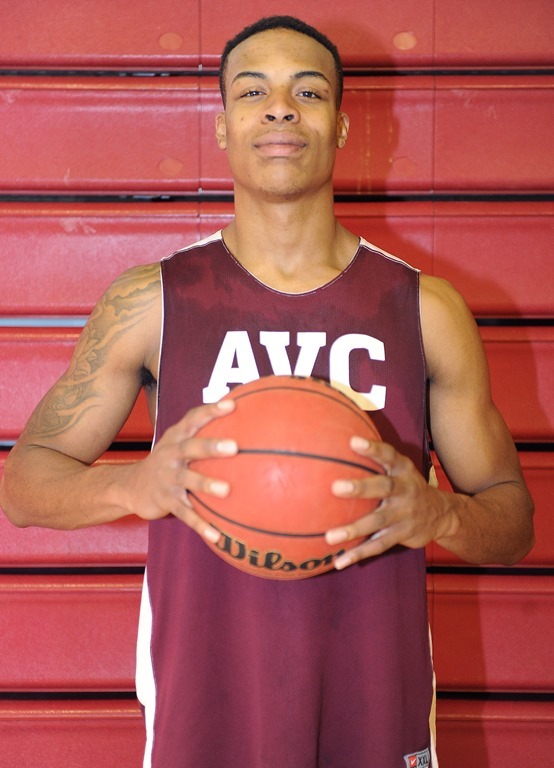 Aaron could have been named the “AVC Player of the Tournament” in the JUCO Summer Shootout this year. He limited his fouls and dominated the paint defensively. Great four games. Aaron decided to move on from AVC as he entered his 4th year at AVC. One year playing basketball at AVC…last year…and three years academically while physicians rebuilt his knees. He and his family decided it was time to move up to a university and get his degree finished. Best of luck to Aaron.